Although part of Italy, the island of Sicily most certainly has its own identity and character. It is a joy to discover the unique Sicilian culture, cuisine and heritage shaped by diverse influences over the course of centuries. Palermo, the island’s capital, is a beautiful city to stroll around, with plenty of cafes and restaurants, and great street food for a more informal option. Some of the main sights are the 12th century Cathedral, the neoclassical Massimo Theatre, and Zisa Castle with its collections of Islamic art & local artefacts. At the Teatro Argento, take in a show of traditional Sicilian puppetry, a local artform which has been kept alive to the present day. On the south coast, don’t miss the Valley of the Temples at Agrigento, an outstanding archaeological site of 6th century Greek temples. Over to the west, Sicily’s second largest city, Catania, has retained much of its history and heritage despite being affected by volcanic activity from nearby Mount Etna over the centuries. Baroque architecture and extravagant Rococo interiors sit alongside Roman era structures include thermal baths and a large amphitheatre. A visit to the fish market is a cultural experience not to miss, followed by a refreshing ‘granita’ drink at a typical kiosk. Other places of interest on the island include the legendary resort town of Taormina, Siracusa with its magnificent Greek and Roman ruins, and the port town of Messina. It has been said that it is worth going to Sicily for the food alone: high praise indeed but it is a statement that stands strong. North African and Arab influences are strong, from the couscous and orange salads, aubergines and caponata to the sorbets and marzipan fruits. These flavours are mixed with the Italian staples of pasta, tomatoes and fresh vegetables to create unique Sicilian dishes. Street food is very popular in Palermo and Catania. Try ‘panelle’ (chickpea fritters), ‘arancini’ (fried rice balls) and ‘sfingi’ (doughnuts covered in honey). Head into the mountains for more robust dishes of meat stews and salami, whilst on the coast the array of seafood is vast. The colourful window displays in the ‘pasticcerie’ will delight. Ricotta and candied fruit stuffed ‘cannoli’, almond cakes, watermelon jelly, and ‘cassata siciliana’ are just a few of the desserts on offer. And, of course, leave room for some delicious gelato. Making ice cream is an art form and a source of pride for Sicilians, and must be sampled during your stay. To accompany your meal, try a Sicilian wine – mostly reds (and the odd rosé) from the foothills of Mount Etna. And finish with the famed dessert wine, Marsala. A variety of festivals are held across Sicily throughout the summer months, from re-enactments of historic events to festivals dedicated to a particular type of music or food. A major annual event in Palermo is the ‘Festa di St. Rosalia’, held in the second week of July, celebrating the liberation of the city from the plague of 1624. Thousands gather to watch the procession headed by a statue of Saint Rosalia, and there is street food and drink, Sicilian music, and fireworks. As a contrast, local folk events are held in the villages of the Madonie each year, including the ‘Giostra dei Ventimiglia’ in Geraci Siculo where costumed characters re-enact key historical events, followed by medieval games, and the ‘Ballo della Cordella’ in Petralia Sottana, an ancient wedding procession re-enactment where a special dance is performed to symbolise fertility and to celebrate the harvest. A mild Mediterranean climate with hot, dry summers defines the climate in Sicily. Most appealing is that Spring arrives early (you can see the almond blossom on the trees in February) making end of March, April, and May lovely months to visit, especially if you enjoy walking. June sees the temperature rising, with July and August enjoying minimum temperatures of 28 degrees. September and October are delightful months if you want to prolong the summer feeling. The sea remains warm allowing you to take a dip in the water on an October or even a November day. 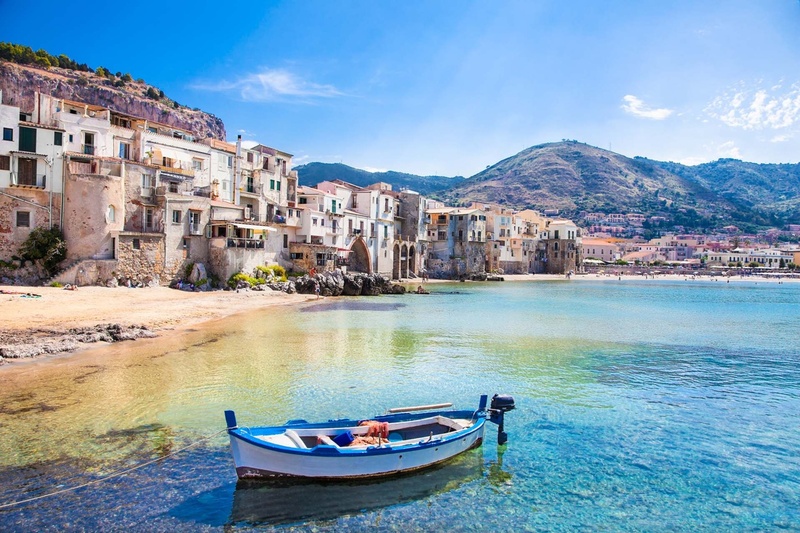 Sicily is well served by a number of flights to Palermo and Catania from all of the major and some of the UK's regional airports. We do not tie you in to a package holiday with prearranged travel; you are free to choose flights from your closest airports and at a time that suits you best. We always recommend that you book your flights as soon as you have booked your property as you will find that fares are usually lower and the choice of flight times is wider. If you need to place a 'hold' on your chosen property whilst you are booking your flights we are more than happy to do this for you. We can book flights on your behalf if you would like us to, for this service we charge a fee of £30 for each return flight booked. This lovely seaside town has an attractive harbour front and atmospheric centre, and has a friendly feel, being popular with Italians and foreign visitors alike. There are several different beaches and a good number of restaurants and bars. 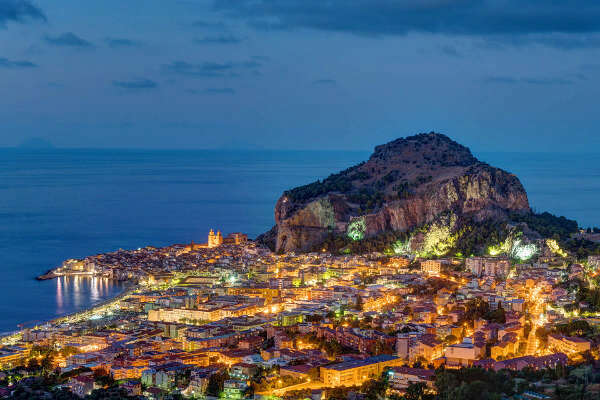 There is plenty to see and do in the town itself and the wider area, and the island’s capital, Palermo, is only an hour or so away.